This article is about the concept in Hinduism. For the computing use, see Avatar (computing). For the 2009 film, see Avatar (2009 film). For other uses, see Avatar (disambiguation). An avatar (Sanskrit: अवतार, IAST: avatāra), a concept in Hinduism that means "descent", refers to the material appearance or incarnation of a deity on earth. The relative verb to "alight, to make one's appearance" is sometimes used to refer to any guru or revered human being. The word avatar does not appear in the Vedic literature, but appears in verb forms in post-Vedic literature, and as a noun particularly in the Puranic literature after the 6th century CE. Despite that, the concept of an avatar is compatible with the content of the Vedic literature like the Upanishads as it is symbolic imagery of the Saguna Brahman concept in the philosophy of Hinduism. The Rigveda describes Indra as endowed with a mysterious power of assuming any form at will. The Bhagavad Gita expounds the doctrine of Avatara but with terms other than avatar. Theologically, the term is most often associated with the Hindu god Vishnu, though the idea has been applied to other deities. Varying lists of avatars of Vishnu appear in Hindu scriptures, including the ten Dashavatara of the Garuda Purana and the twenty-two avatars in the Bhagavata Purana, though the latter adds that the incarnations of Vishnu are innumerable. The avatars of Vishnu are important in Vaishnavism theology. In the goddess-based Shaktism tradition of Hinduism, avatars of the Devi in different appearances such as Tripura Sundari, Durga and Kali are commonly found. While avatars of other deities such as Ganesha and Shiva are also mentioned in medieval Hindu texts, this is minor and occasional. The incarnation doctrine is one of the important differences between Vaishnavism and Shaivism traditions of Hinduism. Incarnation concepts similar to avatar are also found in Buddhism, Christianity, and other religions. The scriptures of Sikhism include the names of numerous Hindu gods and goddesses, but it rejected the doctrine of savior incarnation and endorsed the view of Hindu Bhakti movement saints such as Namdev that formless eternal god is within the human heart and man is his own savior. The Sanskrit noun (avatāra /ˈævətɑːr, ˌævəˈtɑːr/; Hindustani: [əʋˈtaːr]) is derived from the Sanskrit roots ava (down) and tṛ (to cross over). These roots trace back, states Monier-Williams, to -taritum, -tarati, -rītum. Avatar literally means "descent, alight, to make one's appearance", and refers to the embodiment of the essence of a superhuman being or a deity in another form. The word also implies "to overcome, to remove, to bring down, to cross something". In Hindu traditions, the "crossing or coming down" is symbolism, states Daniel Bassuk, of the divine descent from "eternity into the temporal realm, from unconditioned to the conditioned, from infinitude to finitude". An avatar, states Justin Edwards Abbott, is a saguna (with form, attributes) embodiment of the nirguna Brahman or Atman (soul). Neither the Vedas nor the Principal Upanishads ever mention the word avatar as a noun. The verb roots and form, such as avatarana, do appear in ancient post-Vedic Hindu texts, but as "action of descending", but not as an incarnated person (avatara). The related verb avatarana is, states Paul Hacker, used with double meaning, one as action of the divine descending, another as "laying down the burden of man" suffering from the forces of evil. Mahesh is an avatar of Lord Vishnu. The term is most commonly found in the context of the Hindu god Vishnu. The earliest mention of Vishnu manifested in a human form to empower the good and fight against evil, uses other terms such as the word sambhavāmi in verse 4.6 and the word tanu in verse 9.11 of the Bhagavad Gita, as well as other words such as akriti and rupa elsewhere. It is in medieval era texts, those composed after the sixth century CE, that the noun version of avatar appears, where it means embodiment of a deity. The idea proliferates thereafter, in the Puranic stories for many deities, and with ideas such as ansha-avatar or partial embodiments. The term avatar, in colloquial use, is also an epithet or a word of reverence for any extraordinary human being who is revered for his or her ideas. In some contexts, the term avatara just means a "landing place, site of sacred pilgrimage", or just "achieve one's goals after effort", or retranslation of a text in another language. The term avatar is not unique to Hinduism. It is found in the Trikaya doctrine of Mahayana Buddhism, in descriptions for the Dalai Lama in Tibetan Buddhism, and many ancient cultures. The manifest embodiment is sometimes referred to as an incarnation. The translation of avatar as "incarnation" has been questioned by Christian theologians, who state that an incarnation is in flesh and imperfect, while avatar is mythical and perfect. The theological concept of Christ as an incarnation, as found in Christology, presents the Christian concept of incarnation. According to Oduyoye and Vroom, this is different from the Hindu concept of avatar because avatars in Hinduism are unreal and is similar to Docetism. Sheth disagrees and states that this claim is an incorrect understanding of the Hindu concept of avatar. [note 1] Avatars are true embodiments of spiritual perfection, one driven by noble goals, in Hindu traditions such as Vaishnavism. The Vishnu avatars appear in Hindu mythology whenever the cosmos is in crisis, typically because the evil has grown stronger and has thrown the cosmos out of its balance. The avatar then appears in a material form, to destroy evil and its sources, and restore the cosmic balance between the ever-present forces of good and evil. The most known and celebrated avatars of Vishnu, within the Vaishnavism traditions of Hinduism, are Krishna, Rama, Narayana and Vasudeva. These names have extensive literature associated with them, each has its own characteristics, legends and associated arts. The Mahabharata, for example, includes Krishna, while the Ramayana includes Rama. The ten best known avatars of Vishnu are collectively known as the Dasavatara (a Sanskrit compound meaning "ten avatars"). Five different lists are included in the Bhagavata Purana, where the difference is in the sequence of the names. Freda Matchett states that this re-sequencing by the composers may be intentional, so as to avoid implying priority or placing something definitive and limited to the abstract. Matsya Half fish - half man avatar. He saves the world from a cosmic deluge, with the help of a boat made of the Vedas (knowledge), on which he also rescues Manu (progenitor of man) and all living beings. Demon, Hayagriva steals and tries to destroy the Vedas, but Matsya finds the demon, kills him, and returns the Vedas. Kurma[note 2] Tortoise avatar. He supports the cosmos, while the gods and demons churn the cosmic ocean with the help of serpent Vasuki to produce the nectar of immortality (just like churning milk to produce butter). The churning produces both the good and the bad, including poison and immortality nectar. Nobody wants the poison, everyone wants the immortality nectar. The demons attempt to steal the nectar, wherein Vishnu appears as enchantress Mohini avatar, for whom they all fall, and give her the nectar. Varaha Boar avatar. He rescues goddess earth when the demon Hiranyaksha kidnaps her and hides her in the depths of cosmic ocean. The boar finds her and kills the demon, and the goddess holds onto the tusk of the boar as he lifts her back to the surface. Narasimha Half lion-half man avatar. Demon king Hiranyakashipu becomes enormously powerful, gains special powers by which no man or animal could kill him, then bullies and persecutes people who disagree with him, including his own son. The Man-Lion avatar creatively defeats those special powers, kills Hiranyakashipu, and rescues demon's son Prahlada who opposes his own father. The legend is a part of the Hindu festival Holi folklore. Vamana Dwarf avatar. Demon king Bali gains disproportionately enormous powers, ruling the entire universe and abusing it. The dwarf avatar approaches Bali in the form of a monk, when Bali is trying to show off by giving alms at a sacrifice. Bali offers the dwarf any riches he wants, the monk refuses and asks for three steps of land. Bali grants it to him. The dwarf grows, in his first step takes the earth, the second all of the heavens, and for the third the netherworld where Bali returns to. Parashurama Sage with an axe avatar. The warrior class gets too powerful, and seizes other people's property for their own pleasure. The avatar appears as a sage with an axe, kills the king and all his warrior companions. Buddha Subject of Buddhism. Some Hindu texts replace Buddha or another avatar with Balarama, or with Lord Balaji, or with Rishabhanatha, the first Tīrthankara of Jainism. Kalki[note 4] The last avatar appears as a man with a winged white horse, projected to end the Kali yuga, in order that the cosmos may renew and restart. The Bhagavata Purana also goes on to give an alternate list, wherein it numerically lists out 22 Vishnu avatars in chapter 1.3. Avatars like Hayagriva, Hamsa and Garuda are also mentioned in the Pañcaratra making the total of thirty-nine avatars. However, despite these lists, the commonly accepted number of ten avatars for Vishnu was fixed well before the 10th century CE. The avatar concept was further developed and refined in later Hindu texts. One approach was to identify full avatar and partial avatars. Krishna, Rama, and Narasimha were full avatars (purna avatars), while others were partial avatars (ansha avatars). Some declared, states Noel Sheth, that every living creature is an avatar of Vishnu. The Pancharatra text of Vaishnavism declares that Vishnu's avatar include those that are direct and complete (sakshad), indirect and endowed (avesha), cosmic and salvific (vyuha), inner and inspirational (antaryamin), consecrated and in the form of image (archa). Yet another classification, developed in Krishna schools, centers around Guna-avatars, Purusha-avatars and Lila-avatars, with their subtypes. The Guna-avatar classification of avatars is based on the Guṇas concept of the Samkhya school of Hindu philosophy, that is Rajas (Brahma), Sattva (Vishnu), and Tamas (Shiva). These personalities of the Trimurti are referred to as Guna avatars. The Purushavatara are three. The first evolves the matter (Prakriti), the second is the soul present in each individual creature, the third is the interconnected oneness or Brahman that connects all souls. The Lilavataras are partial or full manifestations of Vishnu, where either some powers (Shakti) or material parts of him exist. Vishnu is Purushavatara. The Matsya, Kurma, and Vamana avatars of Vishnu are Lilavataras. A Purnarupa in this classification, is when Vishnu manifests completely along with his qualities and powers. In Bengal Vaishnavism, Krishna is the Purnarupa. In Shaivism, Bhairava is the purnarupa of Shiva. The Guru Granth Sahib reverentially includes the names of numerous Hindu deities, including Vishnu avatars such as Krishna, Hari, and Rama, as well those of Devi as Durga. Dasam Granth has three major compositions, one each dedicated to avatars of Vishnu (Chaubis avatar) and Brahma. However, Sikhism rejects the doctrine of savior incarnation, and only accepts the abstract nirguna formless god. The Sikh Gurus endorsed the view of Hindu Bhakti movement saints such as Namdev (≈1270 – 1350 CE) that formless eternal god is within human heart and man is his own savior. The Linga Purana declares that Ganesha incarnates to destroy demons and to help the gods and pious people. The two upapuranas – Ganesha Purana and Mudgala Purana – detail the avatars of Ganesha. Both these upapuranas are core scriptures of the Ganapatya sect – exclusively dedicated to Ganesha worship. Four avatars of Ganesha are listed in the Ganesha Purana: Mohotkata, Mayūreśvara, Gajanana and Dhumraketu. Each avatar corresponds to a different yuga, has a different mount and different skin complexion, but all the avatars have a common purpose – to slay demons. Vakratunda (Vakratuṇḍa) ("twisting trunk"), his mount is a lion. Ekadanta ("single tusk"), his mount is a mouse. Mahodara ("big belly"), his mount is a mouse. Gajavaktra (or Gajānana) ("elephant face"), his mount is a mouse. Lambodara ("pendulous belly"), his mount is a mouse. 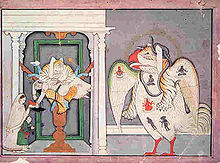 Vikata (Vikaṭa) ("unusual form", "misshapen"), his mount is a peacock. Vighnaraja (Vighnarāja) ("king of obstacles"), his mount is the celestial serpent Śeṣa. Dhumravarna (Dhūmravarṇa) ("grey color") corresponds to Śiva, his mount is a horse. Although Puranic scriptures contain occasional references to avatars of Shiva, the avatar doctrine is neither universally accepted nor commonly adopted in Shaivism. The views on the doctrine of incarnation has been one of the significant doctrinal differences between Vaishnavism and Shaivism, in addition to their differences on the role of householder life versus monastic life for spiritual release. Shaivism is a transcendental theology, where man, with the help of his Guru, is his own savior. The Linga Purana lists twenty-eight avatars of Shiva. In the Shiva Purana there is a distinctly Saivite version of a traditional avatar myth: Shiva brings forth Virabhadra, one of his terrifying forms, in order to calm Narasimha, an avatar of Vishnu. When that fails, Shiva manifests as the human-lion-bird Sharabha which calms down lion-man Narasimha avatar of Vishnu, and Shiva then gives Vishnu a chakra as gift. A similar story is told in the late medieval era Sharabha Upanishad. However, Vaishnava Dvaita school refutes this Shaivite view of Narasimha. The monkey-god Hanuman who helped Rama – the Vishnu avatar is considered by some to be the eleventh avatar of Rudra (Shiva). Some regional deities like Khandoba are also believed by some to be avatars of Shiva. Shesha and his avatars (Balarama and Lakshmana) are occasionally linked to Shiva. Adi Shankara, the formulator of Advaita Vedanta, is also occasionally regarded as an avatar of Shiva. In Dasam Granth, Guru Gobind Singh mentioned two avatars of Rudra: Dattatreya Avatar and Parasnath Avatar. Avatars of Devi. From up to down: Durga, Kali, Sita, Parvati. Avatars are also observed in Shaktism, the sect dedicated to the worship of the Goddess (Devi), but they do not have universal acceptance in the sect. The Devi Bhagavata Purana describes the descent of Devi avatars to punish the wicked and defend the righteous – much as the Bhagavata Purana does with the avatars of Vishnu. Like Vishnu, his consort Lakshmi incarnates as Sita and Radha – the consorts of Rama and Krishna avatars. Nilakantha, an 18th-century commentator on the Devi Bhagavata Purana – which includes the Devi Gita – says that various avatars of the Goddess includes Shakambhari and even the masculine Krishna and Rama – generally thought to be Vishnu's avatars. Lakshmi and Saraswati are main goddesses worshipped as Devi avatars. Sridevi and Bhudevi are two different forms of the goddess Lakshmi. Dharini, the consort of Parashurama, Sita, the consort of Rama, and Yashodhara, the consort of Siddhartha, along with the consorts of the previous incarnations of Vishnu, are all considered full incarnations of Lakshmi. On the other hand, Radha and the gopis, Rukmini, Satyabhama and the rest of Krishna's wives with the exception of Yamuna, are all considered partial incarnations of Lakshmi. In Dasam Granth, second scriptures of Sikhs written by Guru Gobind Singh, mentioned seven Brahma Avatars. According to the Skanda Purana, Brahma incarnated himself as Yajnavalkya in response to a curse from Shiva. ^ Mohini, the female avatar of Vishnu, appears in stories about the Kurma avatar. ^ Some versions include Balarama (the elder brother of Krishna) as the eighth avatar, with Krishna listed as the ninth instead of Buddha, while others replace Buddha with Balarama as the ninth avatar. Jayadeva in his Git Govinda instead adds both Balarama and Buddha, but omits Krishna as he is taken as the equivalent of Vishnu, the origin of all avatars. ^ Some medieval Indian texts spell it as Kalkin. ^ Geoffrey Parrinder (1997). Avatar and Incarnation: The Divine in Human Form in the World's Religions. Oneworld. pp. 19–20. ISBN 978-1-85168-130-3. ^ a b c d e f Monier Monier-Williams (1923). A Sanskrit-English Dictionary. Oxford University Press. p. 90. ^ a b c Sheth 2002, pp. 98-99. ^ a b c d Daniel E Bassuk (1987). Incarnation in Hinduism and Christianity: The Myth of the God-Man. Palgrave Macmillan. pp. 2–4. ISBN 978-1-349-08642-9. ^ a b Paul Hacker 1978, pp. 424, also 405–409, 414–417. ^ Sheth 2002, pp. 98–99. ^ a b Kinsley, David (2005). Lindsay Jones, ed. Gale's Encyclopedia of Religion. 2 (Second ed.). Thomson Gale. pp. 707–708. ISBN 978-0-02-865735-6. ^ a b Bryant, Edwin Francis (2007). Krishna: A Sourcebook. Oxford University Press US. p. 18. ISBN 978-0-19-514891-6. ^ Sheth 2002, pp. 98–125. ^ David R. Kinsley (1998). Tantric Visions of the Divine Feminine: The Ten Mahāvidyās. Motilal Banarsidass. pp. 115–119. ISBN 978-81-208-1522-3. ^ a b Lai Ah Eng (2008). Religious Diversity in Singapore. Institute of Southeast Asian Studies, Singapore. p. 221. ISBN 978-981-230-754-5. ^ a b c Sheth 2002, pp. 115-116 with note 2. ^ a b c Eleanor Nesbitt (2005). Sikhism: A Very Short Introduction. Oxford University Press. pp. 16, 24–25. ISBN 978-0-19-157806-9. ^ "avatar". Random House Webster's Unabridged Dictionary. ^ a b c Sheth 2002, p. 98. ^ a b c d Matchett, Freda (2001). Krishna, Lord or Avatara? : the relationship between Krishna and Vishnu. 9780700712816. p. 4. ISBN 978-0-7007-1281-6. ^ a b c d Sheth 2002, p. 99. ^ a b James Lochtefeld 2002, p. 228. ^ King, Anna S. (2005). The intimate other: love divine in Indic religions. Orient Blackswan. pp. 32–33. ISBN 978-81-250-2801-7. ^ a b Mishra, Vibhuti Bhushan (1973). Religious beliefs and practices of North India during the early mediaeval period, Volume 1. BRILL. pp. 4–5. ISBN 978-90-04-03610-9. ^ Rukmani, T. S. (1970). A critical study of the Bhagavata Purana, with special reference to bhakti. Chowkhamba Sanskrit studies. 77. Varanasi: Chowkhamba Sanskrit Series. p. 4. ^ Matchett 2001, p. 160. ^ James Lochtefeld 2002, pp. 228-229. ^ a b James Lochtefeld 2002, pp. 705-705. ^ James Lochtefeld 2002, p. 119. ^ James Lochtefeld 2002, pp. 421-422. ^ a b James Lochtefeld 2002, p. 737. ^ James Lochtefeld 2002, pp. 500-501. ^ James Lochtefeld 2002, pp. 550-552. ^ James Lochtefeld 2002, pp. 370-372. ^ Sheth 2002, p. 117 with notes 12 and 13. ^ Roshen Dalal (2010). Hinduism: An Alphabetical Guide. Penguin. p. 112. ISBN 978-0-14-341421-6. , Quote: "A Dashavatara panel at Vijayanagara has Matsya, Kurma, Varaha, Narasimha, Vamana, Parasurama, Rama, Balarama, Jina, Kalkin. A Jina, a Jain Tirthankara was also depicted in Dashavatara panels elsewhere including in Gujarat." ^ James Lochtefeld 2002, p. 128. ^ Bhardwaj, Deshraj (1988). Baba Mohan Ram Itihas. Gaon Tighra Press. p. 2. ^ Schrader, Friedrich Otto (1916). Introduction to the Pāñcarātra and the Ahirbudhnya saṃhitā. Adyar Library. p. 42. ^ a b c d e f Sheth 2002, p. 100. ^ a b c d Barbara A. Holdrege (2015). Bhakti and Embodiment: Fashioning Divine Bodies and Devotional Bodies in Krsna Bhakti. Routledge. pp. 50–67. ISBN 978-1-317-66910-4. ^ Janmajit Roy (2002). Theory of Avatāra and Divinity of Chaitanya. Atlantic Publishers. pp. 190–191. ISBN 978-81-269-0169-2. ^ a b Daniel E Bassuk (1987). Incarnation in Hinduism and Christianity: The Myth of the God-Man. Palgrave Macmillan. pp. 143–144. ISBN 978-1-349-08642-9. ^ Mittal, Sushil (2004). The Hindu World. New York: Routledge. p. 164. ISBN 978-0-203-67414-7. ^ David Smith (2003). The Dance of Siva: Religion, Art and Poetry in South India. Cambridge University Press. p. 186. ISBN 978-0-521-52865-8. ^ Pashaura Singh; Norman Gerald Barrier; W. H. McLeod (2004). Sikhism and History. Oxford University Press. pp. 136–147. ISBN 978-0-19-566708-0. ^ William Owen Cole (2004). Understanding Sikhism. Dunedin Academic. pp. 47–49. ISBN 978-1-903765-15-9. ^ Pashaura Singh (2011). Mark Juergensmeyer and Wade Clark Roof, ed. Encyclopedia of Global Religion. SAGE Publications. p. 138. ISBN 978-1-4522-6656-5. ^ Grimes, John A. (1995). Gaṇapati: song of the self. SUNY Press. p. 105. ISBN 978-0-7914-2439-1. ^ Parrinder, Edward Geoffrey (1982). Avatar and incarnation. Oxford: Oxford University Press. pp. 87–88. ISBN 978-0-19-520361-5. ^ a b Mariasusai Dhavamony (2002). Hindu-Christian Dialogue: Theological Soundings and Perspectives. Rodopi. p. 63. ISBN 978-90-420-1510-4. ^ Winternitz, Moriz; V. Srinivasa Sarma (1981). A History of Indian Literature, Volume 1. Motilal Banarsidass. pp. 543–544. ISBN 978-81-208-0264-3. ^ Sharma, B. N. Krishnamurti (2000). A history of the Dvaita school of Vedānta and its literature: from the earliest beginnings to our own times. Motilal Banarsidass. p. 412. ISBN 978-81-208-1575-9. ^ Lutgendorf, Philip (2007). Hanuman's tale: the messages of a divine monkey. Oxford University Press US. p. 44. ISBN 978-0-19-530921-8. ^ Catherine Ludvík (1994). Hanumān in the Rāmāyaṇa of Vālmīki and the Rāmacaritamānasa of Tulasī Dāsa. Motilal Banarsidass Publ. pp. 10–11. ISBN 978-81-208-1122-5. ^ Sontheimer, Gunther-Dietz (1989). "Between Ghost and God: Folk Deity of the Deccan". In Hiltebeitel, Alf. Criminal Gods and Demon Devotees: Essays on the Guardians of Popular Hinduism. State University of New York Press. p. 332. ISBN 978-0-88706-981-9. ^ Matchett, Freda (2001). Krsna: Lord or Avatara?. Routledge. p. 63. There are strong links between Samkarsana/Sesa and Siva, so that it is not difficult to see in this pale companion of the dark Krsna a reminder of Siva’s parity with Visnu, even though Visnu still has the lead. ^ The Padma-Purana: Part IX. Delhi: Motilal Banarsidass. 1956. pp. 3164–3165. The Lord, Visnu, took his place in the egg. Then with his mind devoted to the supreme spirit, Brahma meditated upon Visnu. At the end of the meditation a drop of perspiration was produced from his forehead. That drop, of the shape of a bubble, in a moment fell on the earth. O you of an excellent face, I, having three eyes, a trident, and adorned with the crown of the matted hair, was born from that bubble. With modesty I asked the lord of gods: "What shall I do?" Then God Visnu, with delight, thus spoke to me: "O Rudra, you will bring about a fierce-looking destruction of the world, (after) actually being (my) portion, viz. Samkarsana, O you of an excellent face." ^ Mahalik, Er. Nirakar (2010). "Lord Balarama" (PDF). Orissa Review. So Balarama became (Bala+Deva) Baladeva. Krishna and Balarama are regarded as Hari and Hara. Here Balarama is regarded as Lord Siva. Siva is helping Vishnu in every incarnation like Rama-Laxman in Tretaya Yuga. In Dwapar Yuga as Krishna-Balarama and in Kali Yuga they are Jagannath and Balabhadra. ^ Pattanaik, Devdutt (2010). "Elder Brother of God". Devdutt. Some say that Krishna is Vishnu, Balarama is Shiva and Subhadra is Devi, thus the three siblings represent the three main schools of Hindu theism: Vaishnava, Shaiva and Shakta. ^ Doniger, Wendy (2010). The Hindus: An Alternative History. Oxford University Press. p. 508. The gods complained to Shiva that Vishnu had entered the body of the Buddha on earth for their sake, but now the haters of religion, despising Brahmins and the dharma of class and stage of life, filled the earth. “Not a single man performs a ritual, for all have become heretics—Buddhists, Kapalikas, and so forth—and so we eat no offerings.” Shiva consented to become incarnate as Shankara, to reestablish Vedic dharma, which keeps the universe happy, and to destroy evil behavior. ^ Brown, Cheever Mackenzie (1990). The triumph of the goddess: the canonical models and theological visions of the Devī-Bhāgavata Purāṇa. SUNY Press. p. 32. ISBN 978-0-7914-0363-1. ^ Hindu Avatāra and Christian Incarnation: A Comparison, Noel Sheth Philosophy East and West, Vol. 52, No. 1 (Jan., 2002), pp. 98, 117. ^ Kapoor, S.S. Dasam Granth. Hemkunt Press. p. 16. ISBN 9788170103257. Retrieved 2017-02-24. ^ The Skanda-Purana: Part XVII. Delhi: Motilal Banarsidass. 2002. p. 130. After seeing his (of Brahma) aberration on the altar at the time of marriage, Sambhu cursed him. He was then born as Yajnavalkya. Sakalya engaged Yajnavalkya in the royal palace for the performance of the Santi rites. Paul Hacker (1978). Lambert Schmithausen, ed. Zur Entwicklung der Avataralehre (in German). Otto Harrassowitz. ISBN 978-3447048606. James Lochtefeld (2002). The Illustrated Encyclopedia of Hinduism, Vol. 1&2. Rosen Publishing. ISBN 978-0-8239-2287-1. Sheth, Noel (2002). "Hindu Avatāra and Christian Incarnation: A Comparison". Philosophy East and West. 52 (1 (January)): 98–125. doi:10.1353/pew.2002.0005. JSTOR 1400135. Look up avatar in Wiktionary, the free dictionary. Wikisource has the text of the 1911 Encyclopædia Britannica article Avatar.